Madeira won the 4july blue Marlin World Cup 5 times. 3 in the 90s and 2015/16 again. The surprisingly rich fishing grounds of Madeira provide ample opportunity to spot and catch truly great fish, especially when schools of blue or white Marlin arrive and feed from May to early October. 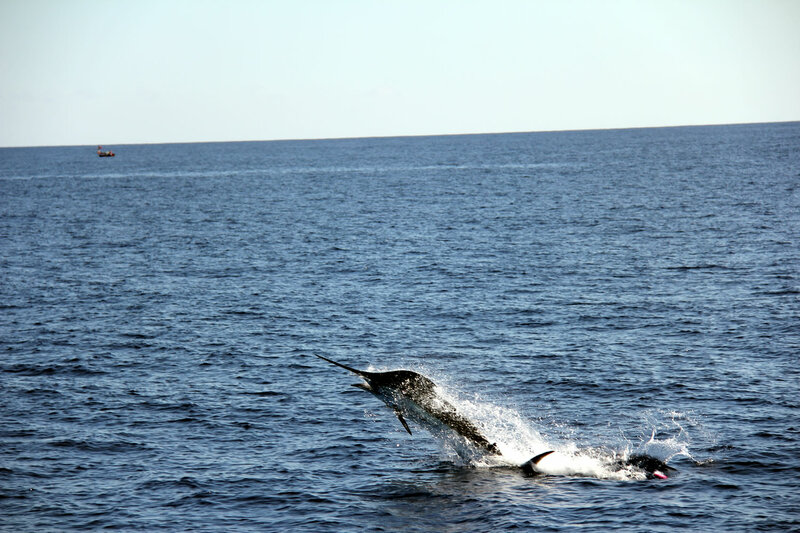 With a great number of splendid and uncomplicated fishing spots for the Marlin (also known as billfish) Madeira has made a name for itself as one of the top destinations for saltwater sportfishing. Both its sunny, mild climate and permanently warm waters are attractive to the Atlantic Blue Marlins, which regularly pass through the copious feeding grounds with abound schools of bait fish off the coast of Madeira. Some of them are huge, exceeding the 1000 pound mark and more often than not normal catches boast an average size well in the region of 500 pounds. The Atlantic Blue Marlin can reach an extraordinary length of 5 metres and swim at high speeds of up to 80 km/h. Due to its favourable location, the stunning blue waters off the south coast of the island are the most preferred fishing grounds for Marlin Fishing Madeira. In Madeira deep sea fishing begins quite near the coastline, so great catches can be expected to be made even within one or two miles off the shore. For Marlin Fishing Madeira the “Dream Catcher”, an American style 1988 Rampage 31, is definitely a smart choice for anglers wanting to experience the absolute fishing highlight in Madeira. The “Dream Catcher” is fully equipped with all the latest technological devices and amenities that will facilitate fishing activities on the charter boat. Comfortable seating on the spacious flybridge, a fighting chair as well as appropriate lures and live baits for the largest game fish in the world are also standard equipment and for anglers on board available. Moreover, the view from the flybridge is fascinating, especially when observing the unbelievable and awesome sight of a gigantic hooked Blue Marlin jumping out of the water and struggling to triumph in this supreme fight. As a consequence, boat charter Marlin Fishing with the “Dream Catcher” is the perfect choice for ardent fishermen wishing to test and demonstrate their skills and abilities. The Captain of the “Dream Catcher” and his first mate are there to actively assist and support anglers with their expertise and know-how by offering proper guidance and suggesting the different systems for Blue and White Marlin fishing. 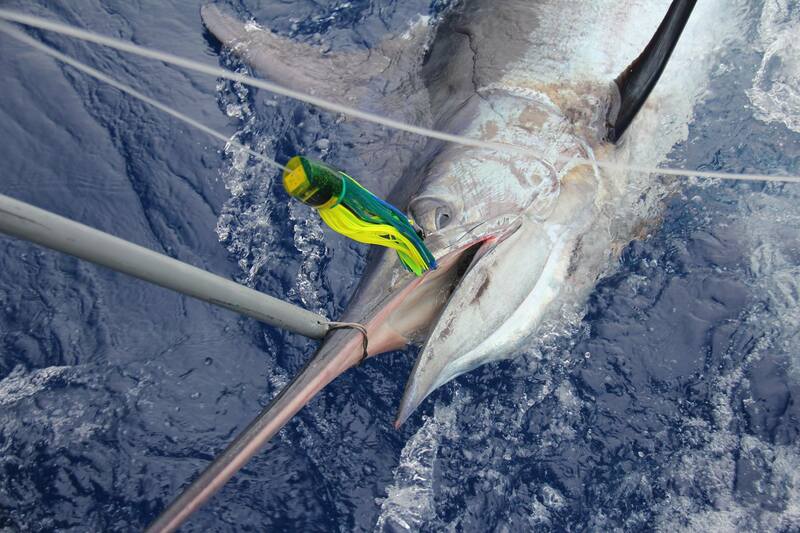 As a predatory fish the Blue Marlin reacts superbly to artificial lures such as rubber skirted lures. Nevertheless, live baits should not be ruled out, as they are a more effective option when fishing for the Blue Marlin in limited fishing areas, where the charter boat has to travel slower, thus securing the baits remain in good condition. In both cases slow trolling is the main method, which requires a lot of patience and persistence.